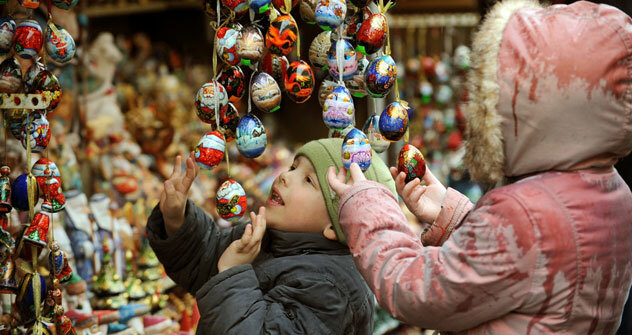 Orthodox Easter cuisine in Russia keeps pace with the liturgy’s potent symbols of resurrection, the triumph of light over darkness, and the return of spring. During Holy Week, Russians bake a light, dry traditional Easter bread, called kulich, and color and decorate hard-boiled eggs, which sadly fewer people these days seem to do in the traditional manner with the skin of yellow onions boiled in water. Orthodox Christians bring their eggs and kulich to their parish church for a Pascal blessing. Together with a sweet, rich, creamy curd cheese mold, spiked with spices, candied fruit, and citrus zest called paskha, these are the fundamentals of the Easter meal, right after the lengthy service, which culminates in the joyful Easter greeting “Xhristos Voskres!” or “The Lord Hath Risen!” to which the faithful respond, “He is Risen Indeed!” In Church Slavonic, this phrase is rendered by the Cyrillic letters “XB,” a motif which appears on eggs, kulich, and the paskha. I remember my first Russian Easter as a frantic hunt, not for eggs and chocolate, but for bake ware. Although I have a sizable arsenal of pots, pans, pie and tart dishes, and other baking paraphernalia, none of them is suitable for the Easter confections. I wanted to do the thing properly: kulich is tall and cylindrical with a slightly puffy mushroom-like cap on top. Paskha is traditionally prepared in a special trapezoidal mold called a pasochnitsa decorated with elaborate “XBs” and Orthodox Crosses on each panel so that the chilled mold retains the imprint of these seasonal decorations. In Russia, sourcing things never comes quite as easily as it does in the rest of the world. Figuring the pasochnitsa would be the harder of the two to run to ground, I started my search there. I prowled supermarkets and specialty kitchen stores to no avail. I checked the farmer’s markets and found nothing but got lucky with some local knowledge. Since the primary ingredients of paskha are cream, curd cheese, or “tvorog,” eggs, and butter, I threw myself on the mercy of the rosy-cheeked ladies who peddle these items at the market. “Try the Churches,” they advised, leaving me wondering why I hadn’t thought of that simple solution. I’d got the scent, and after a slight detour to the three churches in my neighborhood and the Danilovsky Monastery gift shop, I headed strait towards the source: the Sofrino Ecclesiastical Store in Central Moscow where you can buy anything and everything having to do with the Russian Orthodox Church from a slim 2 ruble candle to a 13 million ruble marble baptismal font. There was one pasochnitsa there and I held my breath as four priests cut in line in front of me (apparently they can) to stock up on holy water and wedding crowns, but I was in luck, and, precious pasochnitsa in hand, I literally skipped down the stairs and out into the.